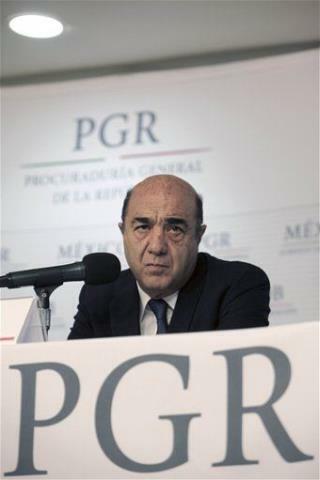 (Newser) – Mexico's attorney general had had about enough of questions over the murder of 43 students gruesomely burned in a 14-hour fire, and said as much on live television Friday. "Ya me canse," said Jesus Murillo Karam, a phrase translated variously as "Enough, I'm tired" and "I've had enough," in attempting to signal the end of an hour-long press conference. Mexicans, it turns out, have had about enough of nearly a decade of mind-numbing violence that has claimed the lives of about 100,000 of their countrymen—and they let Murillo Karam know it, reports the AP. Within hours, Murillo Karam was the not-so-proud inspiration behind #YaMeCanse and #estoycansado ("I'm tired"), reports Reuters. I salute the Mexicans who stay in their country and fight corruption. really shows how much he cares about people and justice! Just curious: Didn't the majority of the privately-held Koch brothers' [Breaking Bad] wealth come from chemicals???????? ?